A few months ago, we did a survey to subscribers of our newsletter and asked, “Are there any subjects which you would like to read about on SDC?” and lots of people asked us for an article more oriented towards families. However, how can we write an article oriented towards families if neither of us has a family? 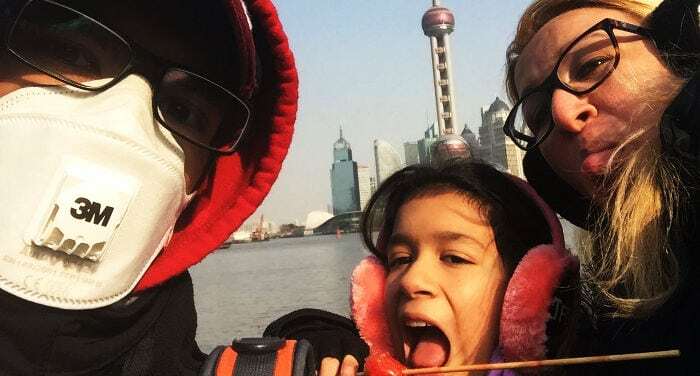 So, a few days ago when I received an email from a Spanish family which had moved to Shanghai and wanted to share their experience and suggestions, I didn’t hesitate for a moment. This article was written by Julio Cesar Castro, who recently moved to Shanghai with his partner and daughter. A few months ago, I fell upon this website by accident, one of those lucky accidents. At that time I contacted them, asked my question and went along with my plan, but the help that I received from here and the advice that the people involved gave me along with the contributions of others like myself have helped me greatly in my new phase in China. So, in addition to giving thanks, I would like to contribute my experience so that it can help others as much as possible. Currently, I am working in Shanghai at the company of a Chinese friend who I met through my previous job. I have been here for two months and came here with my partner and daughter. I want to briefly share the processes which we have had to go through to get to this point and some advice as a father. I am Spanish and obtained the work visa (Z) at the consulate in Madrid. The main requirement was the work authorization which was managed for me the by the Chinese company, which had to provide various documents. As for my part, the main task was having my university degree translated into Chinese. As for my partner, they only gave her a visa for visiting family (S2), a multiple-entry visa with a maximum stay of 90 days (a problem which was subsequently resolved, as I discuss later). The main requirement was the letter of invitation from the Chinese company and all of my papers. For our daughter, they gave us a family visa (S1). The main requirements were family records and the letter of invitation from the company. No matter how hard I tried, I couldn’t get an S1 visa for my partner as we are not married, even though we have a daughter together, family records, joint bank accounts, are registered at the same address, and so on. At the consulate, they were very nice and normally try to help you as long as you are polite. However, what I realized is that if something isn’t possible, it still isn’t possible no matter how much you ask, beg, yell or cry. You have to give it a try but if they tell you no a few times, that means no. The last thing that they told me was that we should go to China with what we had at the moment and when we got there, we should try to get a residency permit for my partner. That was all they could do to help. Once we had all our papers, we prepared for the move. We didn’t bring furniture and brought relatively few things, but even still it wasn’t cheap. The main thing to take into account are the restrictions on sending things to China. There is the obvious: no liquids, foods, plants, animals, etc. However, you also shouldn’t bring: books of a political or religious nature, CDs, DVDs, computers or electronic devices (beyond the basics) and wood products, among other things. Any of these things may mean a significant delay and a greater cost to you. Important: You have to take note that in China, even if you are moving, you have to pay taxes and these can represent between 10 and 25 percent of the declared value of your belongings. So, make sure that you are only bringing what you need, to not value it too highly, that you look for a company which doesn’t charge you extras and to bring money (cash) ready for when your things arrive to avoid paying for storage. My suggestion is that if you are going to bring few things, send them by plane and not by boat. By looking around, you are going to save a lot of time and with luck, even money. You can brings things to China and import them as personal belongings once every six months per type of means (once by ship and once by plane). In your suitcases, you will only be able to bring the essentials, so, make sure you pack your suitcases first. That way, you won’t be juggling things around at the last minute and end up leaving behind or giving away important things. Close bank accounts that you don’t need (I recommend leaving at least one for emergencies). Advise you bank and find someone to receive your mail. If you have debts and can pay them before coming, I recommend that you leave behind everything paid. Here, you will have a lot of things to worry about and every headache that you can avoid is time and energy to adapt more quickly and better. Take out a health insurance policy. I haven’t done it but I think that it’s a good idea. If you can, you will feel more at ease and it is something which will help you avoid headaches. Vaccines, most of all for children. Make sure that your vaccines are updated. Go to a clinic (in my case we went to the international vaccination center in Madrid) so that they can inform you about vaccines, medicine and recommendations. It’s better to do all of this at home, in your language, and in the majority of cases, it is much cheaper than in China. Ask your son/daughter’s school for a partial certificate of studies. We haven’t needed it here but they give it to you very quickly and it doesn’t hurt having it. Watch documentaries, learn a bit of the language, read articles, books, magazines and anything which helps you understand a bit and cope once you get here. This is maybe what helps you the most psychologically during the day-to-day. If you are coming with children, it’s very important to make sure that you have a place to arrive. If the company helps you find a house, then perfect. If not, find people that can help you. There are companies that can prepare everything for you and in the worst case, at least can find you a cheap and comfortable hotel where you can establish yourself until you find the ideal place. Personally, I wouldn’t recommend this option. If you have older children, talk with them, explain to them why, how, where and all of the details so that this isn’t a trauma for them. Most of all, don’t lie to them or create a fantasy world for them, but don’t scare them either. It’s very important that surprises are taken in stride, as every day they will see a world completely different form theirs up until now. Make sure that you buy a toy, candy or surprise to be able to give it to your son/daughter when you need to so that they feel a little better and to lighten traumatic situations during the move. I could continue with this list, but you can never be one hundred percent sure what you need, and for the moment, this is what I consider essential. Immediately register with the police (in less than 24 hours). Go to a health center (appointment necessary) to undergo a complete medical analysis (blood samples included) at a cost of around 80 USD. Children don’t have to go through this. Process my work permit (my company processed it and they only asked me for my documents and some photos). Go to the EEAB (Exit and Entry Administration Bureau) with all of the previous documents before 30 days had passed (don’t leave it to the last minute; start the process immediately to avoid surprises). Despite what various people had actively and passively told us about it not being possible, my friends at the company told me that I should try to request a residency permit for my partner, as otherwise she would have to leave China every 90 days to renew her visa along with the nuisance and cost that this implies. Therefore, we went through all the previous procedures before going to the EEAB and when we went there, they rejected our application and said that we weren’t married at all. We tried to get married quickly but it was useless: too much paperwork and too long of a delay. I called the consulate and they said that they couldn’t do anything. I asked several lawyers and they told me the same thing. Finally, a Chinese friend accompanied me to the EEAB once again and we had the luck of talking with a pleasant official who suggested we go to the consulate and request a relationship certificate. At the consulate, they told me at first that if we weren’t married, they couldn’t give it to us. Afterwards, I spoke with a few lawyers and they told me to insist and that the consulate can give you this certificate if you explain exactly what you want. Finally, I made myself understood at the consulate and with: the family records, our passports, IDs, certificate of residency and the birth certificate of our daughter, we demonstrated our relationship and they agreed to give us this document. Luckily, this document gave her the residency permit. There are many other subjects which I could talk about but I have already gone beyond what I had planned. Thanks Camille for visiting us! Great article. I want to add that before I came with my unmarried partner I did the following. Get a notarised document from my country stating I was married under common law and that I had lived with my partner for many years . I then got the Chinese embassy in my country to stamp the document. I then got the consulate for my country in Shanghai to stamp the document. With 4 stamps from 2 governments there isn’t a Chinese clerk around who won’t be able to issue the permit for your partner.